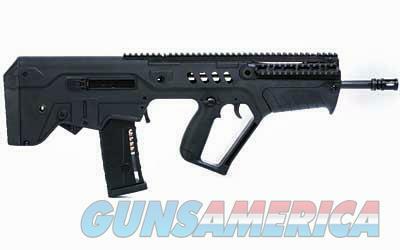 Description: Bullpup configuration; short rifle convenience w/long rifle accuracy and 0ptimized ergonomic design. Long stroke piston operation, high strength impact modified polymer body. Simple field stripping into subassemblies. Last round hold open on empty magazine. All metal parts are corrosion resistance treated. Integral rubber recoil pad • Detachable, cold hammer forged, chrome lined CrMoV steel barrel w/1:7 twist • 100% ambidextrous configuration & operation w/optional left hand bolts • Integral folding adjustable BUIS (backup sights) w/Tritium front post • Integral ambidextrous front & rear quick detachable sling swivel receptacles w/push button swivels • Mil-Std 100% interchangeability of all Tavor® SAR parts • Uses standard AR-15 magazines • Integral rubber recoil pad The firearm that you will receive will be Factory New and Unhandled (NIB). We do not operate a Petting Farm. The photos may be file & catalog photos representative of this item only. NO TRADES PLEASE. Faxed or E-mailed signed FFL’s are acceptable. Alaska & Hawaii Please e-mail before bidding for shipping costs (Long Guns Only). Credit Cards accepted plus 3%. NO SALES TAXES COLLECTED = TAX FREE NEW HAMPSHIRE. Please check your local and state laws before purchasing. Credit Cards accepted plus 3%.